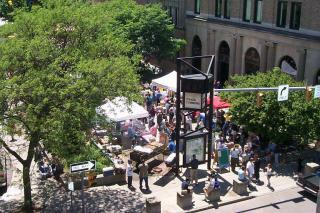 Cultural center of Ithaca, where most community-wide events occur. Contains many of the shops located elsewhere on this map. This site goes out of its way to advertise and hold community programs, such as plays, concerts, family nights, etc, actively encouraging the community to come together. This site includes a building and other spaces for community interaction, such as a playground, basketball court, or park.